Hi, I’m Claire. I make nerdy videos & a fannish podcast! I’m a life-long sci-fi & fantasy fan with a thing for speaking dragons, cross-dressing heroines & magic-as-science. Non-SFF things that make me happy include gruesome Victorian medicine, obscure language facts & most food-related TV. Also a fangirl, cat-mum, Slytherpuff. If you’d like to support what I do, please consider throwing a little monies my way to enable my large hazelnut cappuccino habit. Over on youtube, I make videos about books and nerdy things! I focus mostly on science-fiction and fantasy novels, novellas and graphic works, with some romance, non-fiction and YA sprinkled into the mix. 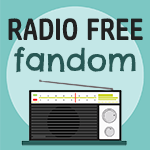 Radio Free Fandom is an aiming-to-be-fortnightly podcast in which my guests & I get down & nerdy about the media and stories that we love. The show aims to celebrate all of the many, varied, weird & wonderful things we love, and all of the many, varied, weird & wonderful ways in which we express our nerdy, fannish obsessions – from intricate narrative analysis to squeeing about fanfic to intricate narrative analysis about fanfic that makes us squee! Come find me on Twitter @clairerousseau for squeeing & ranting or head over to @clairesrousseau on Instagram for cat pictures!